Buy a gory WW2 shooter for your loved one on Valentine's day. Sniper Elite 4 was originally due this year, but in order to keep up with all the cool kids at this year's E3, it has been pushed back to 2017. February 14 2017, to be exact. However, with the delay-nouncement comes a bunch of fresh images to soften the blow, along with a statement explaining the new release date. “Launching Sniper Elite 4 in February gives us the opportunity to take a game that’s already received some of the best preview feedback we’ve ever had," the pair elaborate, "and give it that extra bit of attention. 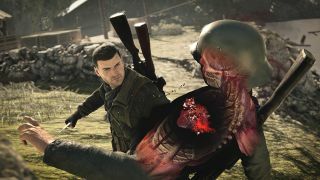 We know a lot of you will be disappointed you won’t get to play Sniper Elite 4 this year, but we feel this decision will prove in the long run to be a win-win for both us and you, the fans”.